Ancillary optical systems: Open up the ultra-close range with the LM macro 40 and the LM macro 80 lenses! The two LM macro 40 and LM macro 80 ancillary lenses offer a successful, value-for-money option for starting to explore the world of micro-organisms. They are an excellent enhancement for objective lens models (fixed focal length and zoom) ranging from 50 to 90 mm in diameter. In particular, due to its small size and low weight, the LM macro 80 is ideally suited for outdoor use. The LM macro 40 has a focal length of 40 mm, and the LM macro 80 has a focal length of 80 mm. Depending on the size of the camera sensor and the focal length of the lens, it is possible to achieve a magnification ratio of up to 2:1. This corresponds to a 12x microscope magnification. Lenses with a maximum focal length of 120 mm and smaller front lens diameters (max. 62 mm) have proven to work best. If this limit is exceeded, there may be a reduction in image quality. Due to the large magnification scale we recommend that you use a stable stand with rack and pinion, such as our LM Macro stand 3. Using the fine focus adjustment of the macro stand, the focal planes can be adjusted precisely, which in turn yields high-quality macro images. The minimum working distance is only 25 mm with the LM macro 40 and 60 mm with the LM macro 80. This makes it possible to achieve a very good contrast and detail resolution capability, which outperforms even much more expensive stereo microscopes. As a result, even large-scale biological or histological slides can be reproduced without having to use a microscope. Taking images freehand (without using a stand) with the LM macro 40 is only possible in exceptional cases. The LM macro 80, however, enables freehand image capture up to a magnification ratio of 1.5:1 and at good lighting conditions. It is also possible to combine two LM macro 80 ancillary lenses. In terms of optics, this corresponds to an LM macro 40 lens. The advantage of this option is that it allows for a large degree of flexibility. All of the camera’s functions such as exposure, zoom and automatic aperture control remain unchanged and can still be used. Both LM macro lenses (40x and 80x) are high-performance tools consisting of two/four hard-coated lenses. 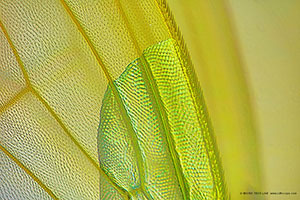 This plan achromatic lens design, which is sophisticated for ancillary lenses, produces macro images with excellent detail focus. This extremely high quality of image definition makes it possible to work with both large microscopic specimens and macroscopic objects. Our macro lenses are not mass produced goods from the Far East, but hand-finished in Austria using the most up-to-date production methods. As we place a great deal of value on high quality standards and durability, we do not use cheap plastic materials, but instead exclusively use CNC machined aircraft-grade aluminium or brass parts and optical components of the highest quality. The LM macro lenses (40x and 80x) come with a 37 mm connecting thread. 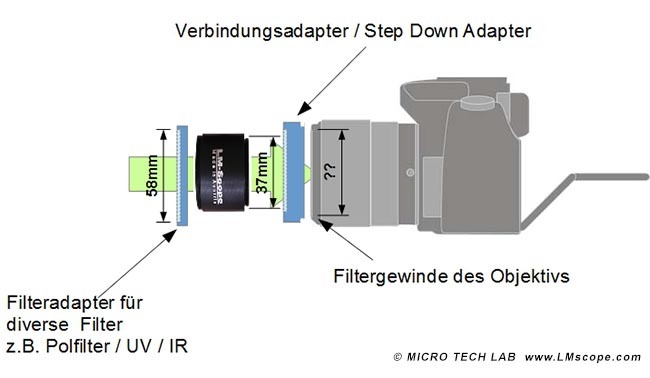 An additional connecting adapter is generally required for attaching the lens to the filter thread of the master lens. If, for example, the master lens has a filter thread of 58 mm, then you will need a step-down ring from 58 mm to 37 mm (STR5837). We carry adapters that fit the most common sizes.